Throughout the state, scores of NUHW members are engaged in the resistance movement to defend working people, immigrants, and an equitable healthcare system. NUHW members’ commitment was on full display at many town halls in recent months. At Congressmember Barbara Lee’s joint town hall with Alameda County Supervisor Wilma Chan, dozens of workers from UCSF Benioff Children’s Hospital Oakland gathered with more than 500 Oakland residents to discuss the importance of retaining services and care through the Affordable Care Act. NUHW members also participated in Assemblymember Jim Wood’s town hall in Eureka and Congressmember Mike Thompson’s town hall in Napa. In Southern California, NUHW members attended a number of events, including a joint meeting with Assemblymember Eloise Reyes and Congressmember Xavier Becerra and a resistance delegation to Congressmember Darrell Issa’s meeting in Oceanside. At these various town halls, many participants provided powerful testimonials about their own experiences trying to navigate our complex and often problematic healthcare system. NUHW members were also out in full force to defend our right to healthcare. Kaiser IBHS and Optical leaders joined hundreds of their neighbors at a community meeting at the Maidu Community Center in Roseville on March 26 to champion Medicare for All in the form of SB 562: The Healthy California Act. Introduced in February by state Senators Ricardo Lara and Toni Atkins, SB 562 would develop a single-payer Medicare for All system that would establish comprehensive and accessible healthcare for all Californians, regardless of employment or immigration status. NUHW is among a broad array of labor and community groups sponsoring the fight for the Healthy California Act. Similarly in Southern California, members marched to defend healthcare as a human right in Los Angeles on March 26 and gathered for a Healthy California town hall in Garden Grove on April 8. 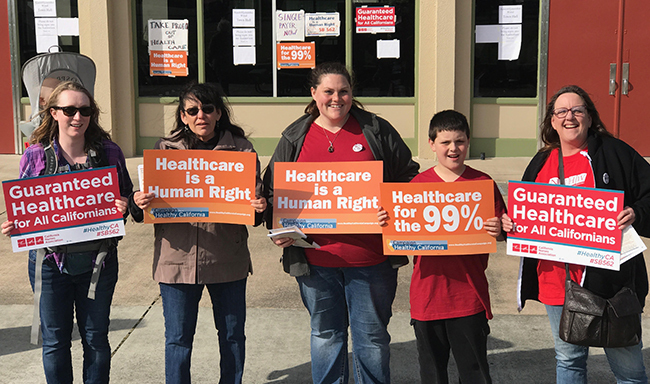 NUHW members rallied for access to healthcare in Eureka. Demand Trump release his tax returns. Various locations in Northern and Southern California. We will explore the next steps of the healthcare fight, including state Senate Bill 562 (Healthcare for all Californians) and immigration issues that are plaguing our communities. Saturday, April 22, 2 – 4 p.m. The single payer bill hits the senate committee floor today. Rally at noon and then a march over to the Capitol for the 1 p.m, hearing. If you need a ride to Sacramento from our Emeryville office, please RSVP first to Vanessa Coe at vcoe@nuhw.org. For more information, please contact Vanessa Coe (vcoe@nuhw.org) for Northern California events and Ruben Sierra (rsierra@nuhw.org) for Southern California events.